A Cell (from Latin cella, meaning "Small Room") is the basic Structural, Functional, and Biological unit of all known Living Organisms. A cell is the Smallest Unit of life that can replicate independently, and cells are often called the "Building Blocks of Life". 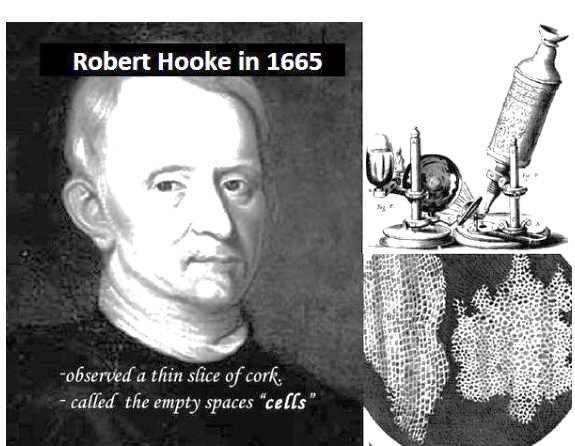 Figure1: Robert Hooke discovered cells in 1665. Hooke saw honeycomb-like structure when he observed thin slices of cork under a microscope. 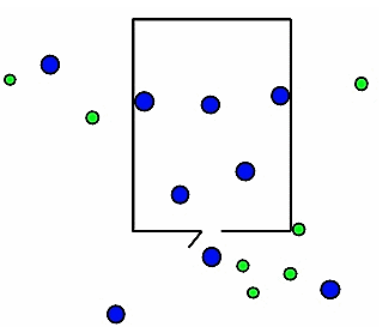 He noticed that each box was separated from the other by a partition or a wall. He was the one to name each of these boxes as cells. *Cork is a part of the bark of a tree. All living organisms are made of cells. 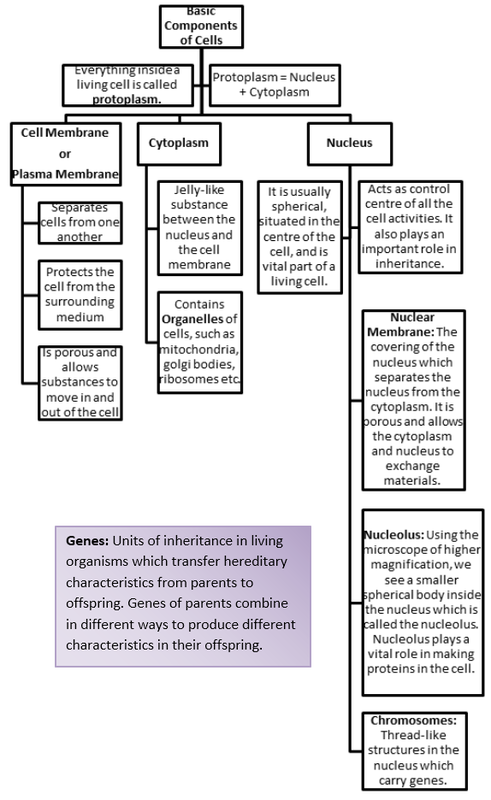 Cells are basic structural or functional units of living organisms. All cells are born out of pre-existing cells through cell division. While cells are often referred to as 'bricks' making up a building, cells are complex living structures that can have a variety of shapes, sizes and functions. Figure 2: An egg of a hen is a single cell which can be seen by the naked eye. To study cells, scientists use microscopes to magnify them. They often use stains (dyes) to colour parts of the cell and study them in detail. There are billions and trillions of cells in a tall tree or a large animal. 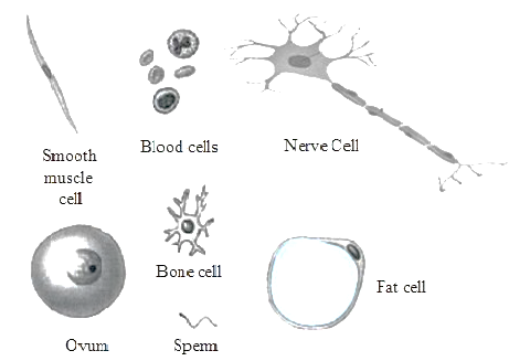 A human body also has trillions of cells which have different shapes, sizes and functions. Multicellular Organisms are made up of more than one cell. For Example, Mango Tree and Frog. 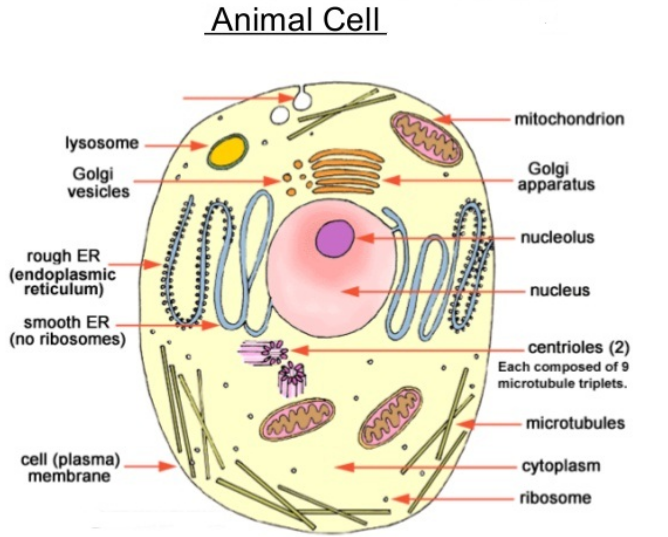 Unicellular Organisms are made up of a single cell. For Example, Amoeba and Paramecium. Multicellular organisms with billions of cells also start their life as a single cell. The fertilised egg (which is a single cell) multiplies to form more cells as the organism develops. The only difference is that while a single cell performs all the functions in the unicellular organisms, multicellular organisms have a specialised group of cells to perform different functions. 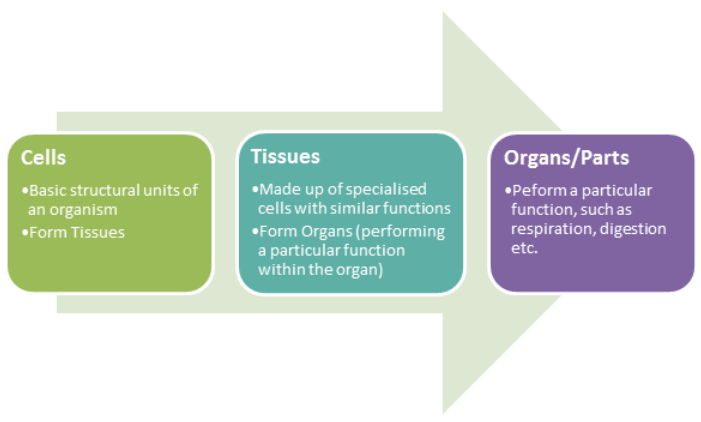 The specialised cells form tissues, which in turn form organs. Amoeba, which is a single-celled organism, does not have a definite shape. Its shape keeps changing as it moves or feeds, protruding parts of its body to form 'pseudo' (meaning 'false') 'podia' (meaning 'feet'). These projects are known as pseudopodia. Humans have millions of cells, such as white blood cells (found in blood), cells that make up muscles, and cells that form nerves. Their shapes vary according to the functions they perform. Most cells are round, spherical or elongated. Some are spindle-shaped which are long and pointed at both ends. Nerve cells or neurons are quite long and are branched out to receive and transfer messages. Shapes of the cells are maintained by a covering called Cell Membrane or Plasma Membrane. Bacterial cells and plant cells have an additional rigid covering called a Cell Wall. The size of the cells may vary from a millionth of a metre (known as a micron) to a few centimetres but most of them cannot be seen with the naked eye. We need microscopes to see these microscopic cells. It is not necessary that the size of cells of a large animal (such as an elephant) will be larger than cells of a small animal (such as a rat). The size of the cell depends on the function it performs. For example, nerve cells of a rat and nerve cells of an elephant perform the same functions and hence, are of the same size. In a unicellular organism, a single cell performs all the basic functions of life but in multicellular organisms there is division of labour. Place a small piece of the dry and thin onion peel in a drop of water on a glass slide. Put a drop of methylene blue solution on this thin layer and place a coverslip on it (while ensuring that no air bubbles get trapped in the coverslip). Place the slide under the microscope. The boundary of the onion cell is a cell membrane, which is covered by another thick covering called the cell wall. The dense round body in the centre of the cell is called the nucleus. The jelly-like substance between the cell membrane and the nucleus is called the cytoplasm. Scrape the inside of your cheek lightly with a clean toothpick. Place it in a drop of water on a glass slide. Add a drop of iodine solution or methylene blue solution and place a coverslip on it. There are some other organelles (or components of cells) too. These include mitochondria, ribosomes, and golgi bodies. Rough Endoplasmic Reticulum (RER): It is lined with ribosomes and hence, look rough. Function of RER: It plays a key role in synthesis of protein as ribosome are attached to it. 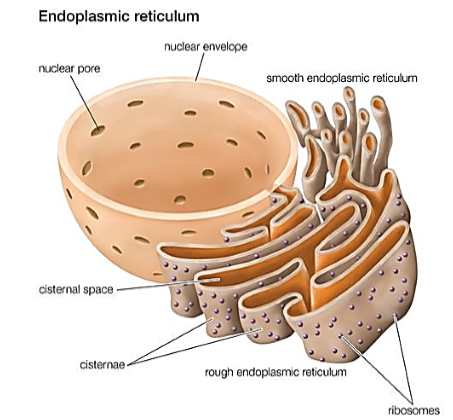 Smooth Endoplasmic Reticulum (SER): It does not have any ribosomes and hence, look smooth. Function of SER: It plays a key role in synthesis of lipids. Ribosomes are spherical bodies made up of RNA (ribonucleic acid) and protein enzyme. They do not have membranes and are present separately in cytoplasm. 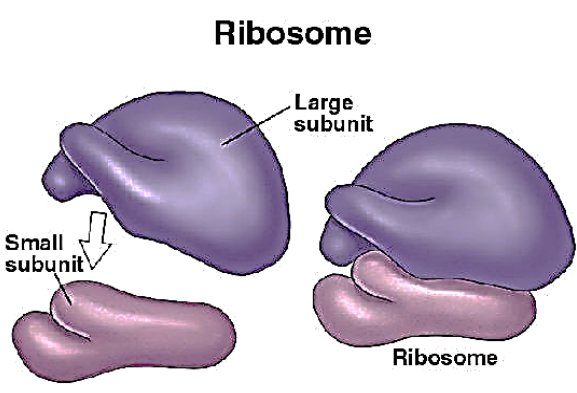 Function of Ribosome: Ribosomes are the sites where the protein synthesis takes place. Smooth, flattened sac-like structures called Cisternae stack together in parallel rows to form Golgi bodies. 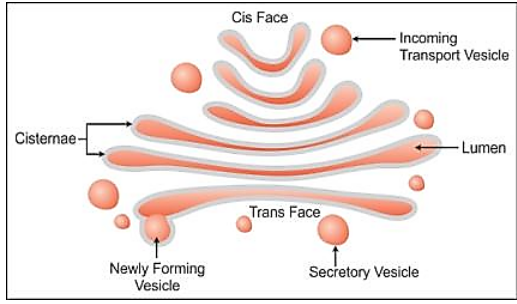 Golgi Cis face receives protein from Endoplasmic reticulum and modifies, packages and stores it. It also dispatches proteins in vesicles to various destinations. Function of Golgi bodies: The Golgi apparatus are responsible for the secretion of enzymes, hormones and proteins. 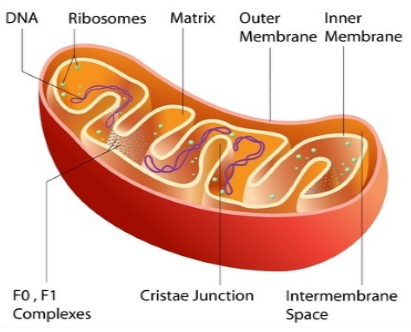 Mitochondria are rod-shaped organelles with a double membrane. The outer membrane is smooth while the inner membrane folds over many times to form cristae. Cristae increase the surface area of the inner membrane by several times. Matrix is  the fluid inside the mitochondria. 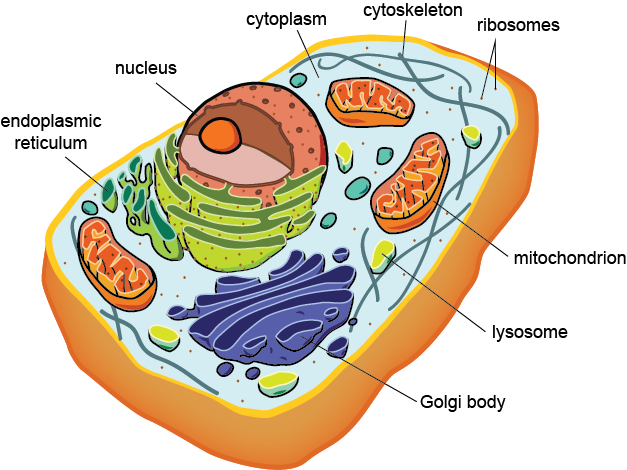 Function of Mitochondria: Mitochondria act as energy production sites and are hence, known as the Powerhouses of the Cell. Lysosomes are sac-like structures surrounded by single-layered membranes. They contain powerful digestive enzymes that can break down all organic material. It acts as a mini digestive system within the cell. Function of Lysosomes: Lysosomes digest damaged cells and a variety of extra- and intra-cellular material. Since they remove cell organelles that are worn out or are not functioning properly and may even digest the entire cells (that are damaged or dead), they are also known as Suicidal Bags. 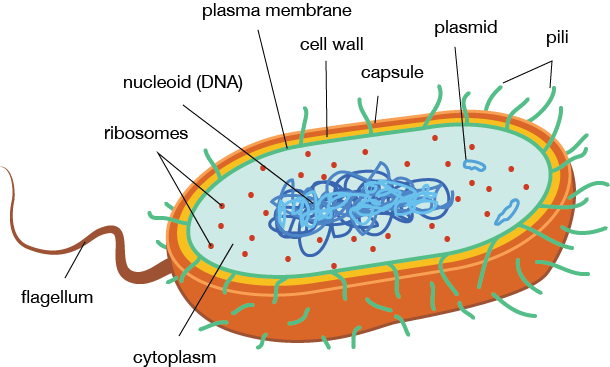 Vacuoles are organelles enclosed by a membrane and filled with fluid. Plant cells usually have a large vacuole filled with a liquid called ‘cell sap’. Cell Sap contains dissolved sugar and salts. 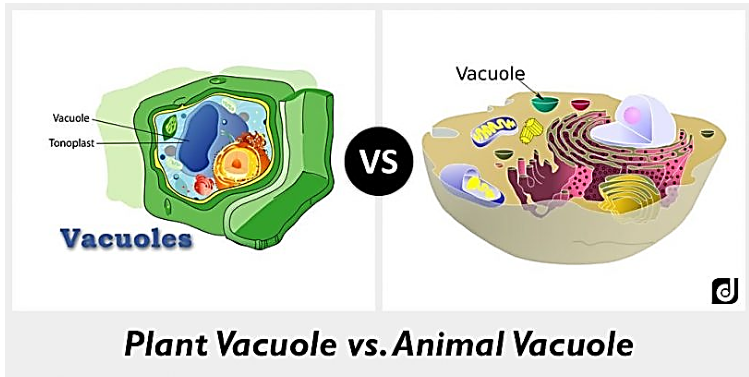 Animal cells may or may not have vacuoles. If they do have vacuoles, they are much smaller than the ones found in plant cells. 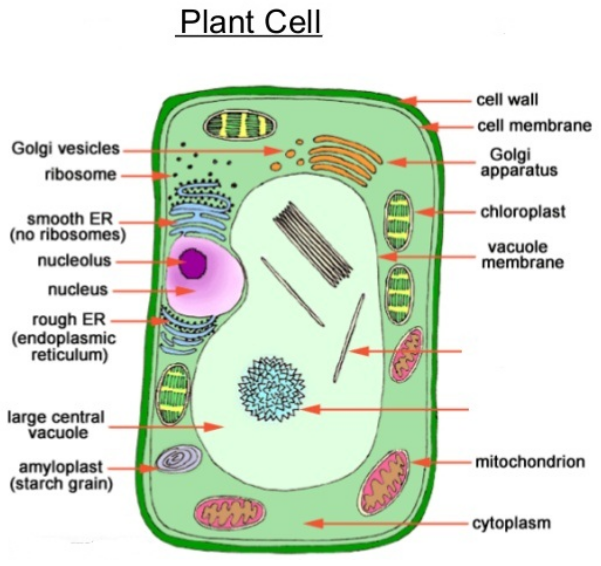 Function of Vacuoles in Plant Cells: Vacuoles in plant cells keep the cells firm or turgid. They store various substances (including waste products of the cell). Function of Vacuoles in Animal Cells: Vacuoles in animal cells store food, water, sugar, minerals and waste products of the cell. In Amoeba, vacuoles that contain food particles are also referred to as food vacuoles. 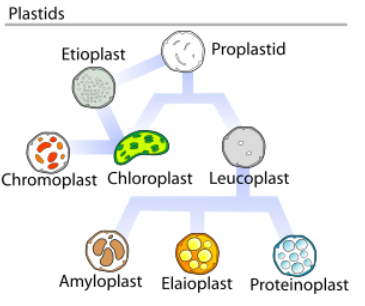 Plastids are also type of organelles that are found only in Plant Cells. Chromoplasts: These contain different-coloured pigments. Most important type of chromoplasts is chloroplast which contain green-coloured pigments called Chlorophyll. Function of Chloroplast: Chloroplasts are the sites where photosynthesis takes place. Here, carbon dioxide and water combine in the presence of energy from the sunlight to produce food. Hence, chloroplasts help in synthesis of food by green plants. How do molecules move in and out of the cell? 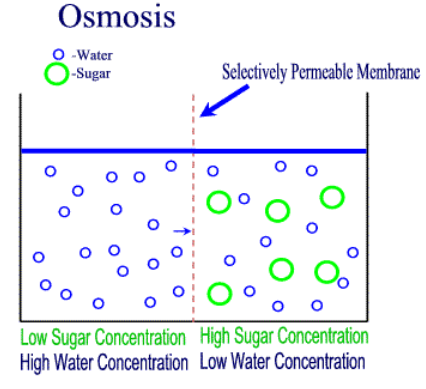 When the solvent moves from the area of dilute solution to the area of concentrated solution through a semipermeable membrane in order to equalize the concentration level of both the solutions, the process is known as ‘Osmosis’. For Example: Roots absorb water from the soil through osmosis. When the particles of any material move from a region of higher concentration to that of lower concentration until the equilibrium is reached, the process is known as ‘Diffusion’. For Example: When you spray perfume, its fragrance spreads in air through diffusion. Takes place in all the three mediums – solids, liquids and gases. Why do plant cells have cell walls? 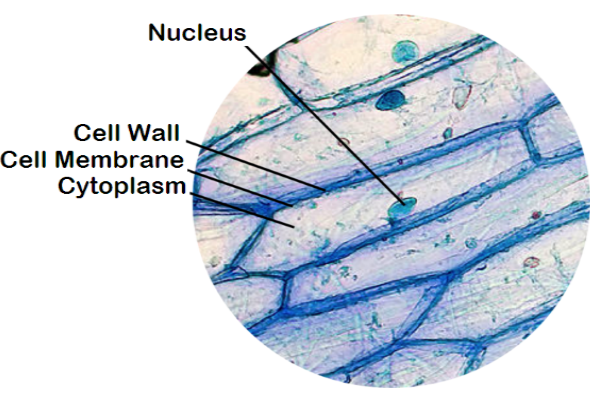 A cell wall is the outer thick layer in plant cells that protect the cell membrane. Since plants cannot move from their place, this cell wall serves to protect their cells from the possible damage by temperature variations, high wind speed, atmospheric moisture etc. 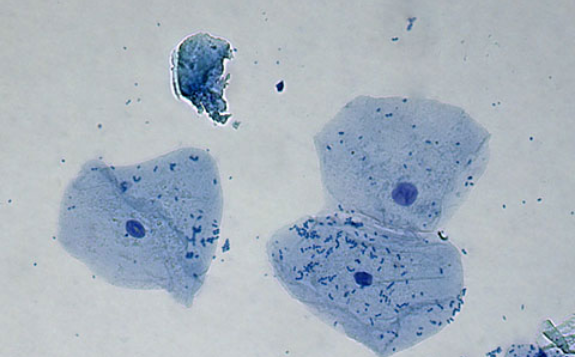 Bacterial cells and cells of blue-green algae do not have well-defined nuclei (plural of nucleus) like those of multi-cellular organisms. The cells of such organisms have nuclear materials without the nuclear membrane. Such cells are called prokaryotic cells where 'pro' stands for 'primitive' and 'karyon' stands for 'nucleus'. Organisms with prokaryotic cells are known as prokaryotes. Plant and animal cells with well-organised nucleus with nuclear membrane are called eukaryotic cells. 'Eu' stands for 'true' while 'karyon' stands for 'nucleus'. Organisms with eukaryotic cells are known as Eukaryotes. DNA is clumped in an area but there is no organised nucleus with a membrane. True nucleus is present, which is well-organised and has a nuclear membrane. Usually have organelles like Golgi bodies, lysosomes, endoplasmic reticulum etc. We also know that only plant cell, Bacterial and fungal cells have Cell Walls. Plants have larger vacuoles while animals have smaller vacuoles. Vacuoles store water or food for plants and even store waste products until they can be discarded. Plants need bigger vacuoles as they cannot move to satisfy their hunger or thirst. Only plant cells have plastids. They help in manufacturing or storing food. Only animal cells have centrioles. Centrioles help in the division of cells.